Good morning, everyone! Amy Copeland here with a cheerful little encouragement card featuring Hello Bluebird stamps and dies. These images are so cute and playful, I couldn't resist making a scene card. 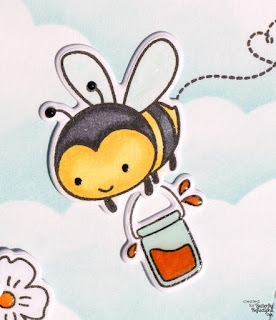 I started with the background, using a Cloud Stencil by MFT Stamps and a foam Ink Blending tool to blend Tumbled Glass Distress Oxide ink onto a piece of smooth white cardstock. I cut the panel out with an A2-sized (4 1/4 x 5 1/2) inch Stitched Rectangle die. 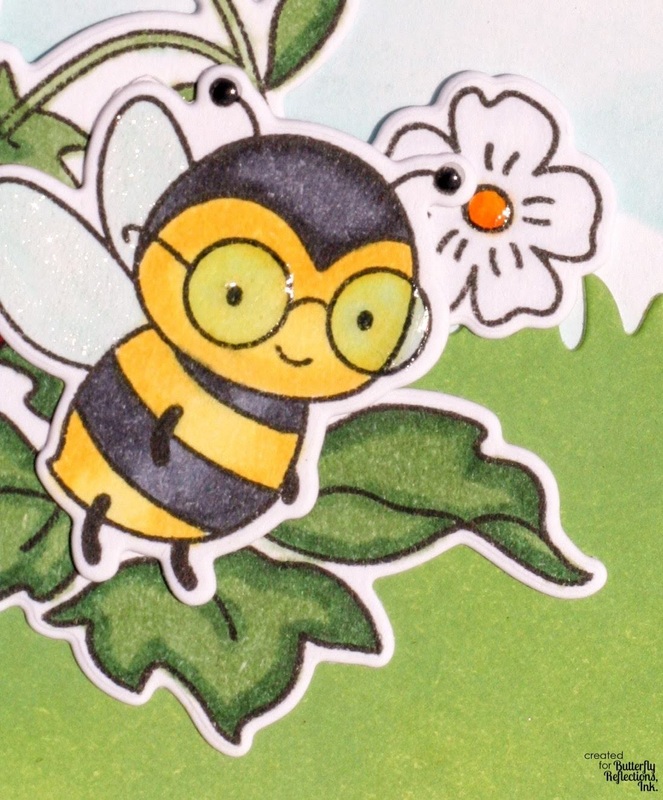 I used another piece of smooth white cardstock and blended a light layer of Twisted Citron Distress Oxide on top, then blended Mowed Lawn on top of that. I cut the green panel out with the same stitched rectangle die that I used on the sky piece, then used the Grassy Knoll dies by Hello Bluebird to cut the grassy border. I set the background pieces aside and then got to work on the cute images. 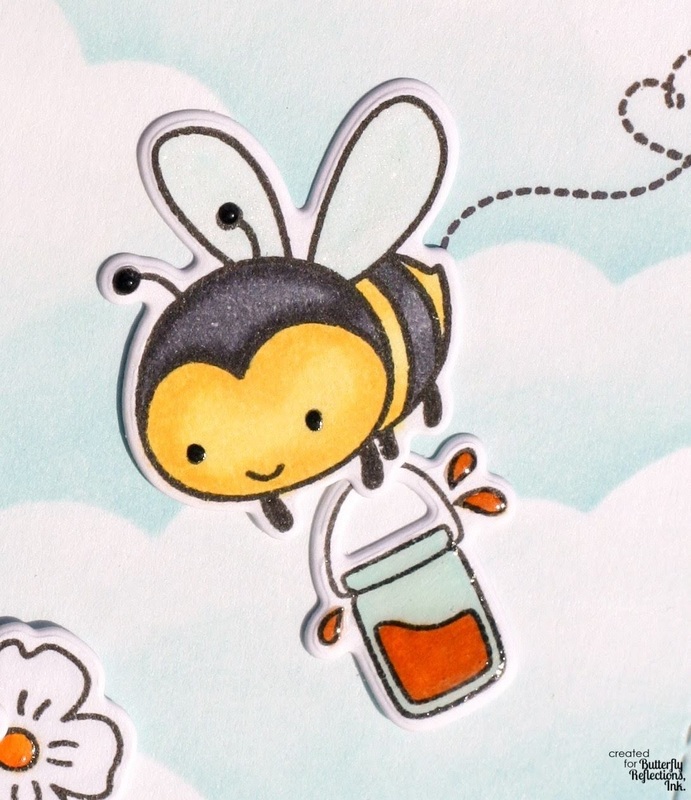 I stamped all of my images from the Hello Bluebird stamp set Bee Happy with Copic Friendly ink and then colored them in with Copic markers. 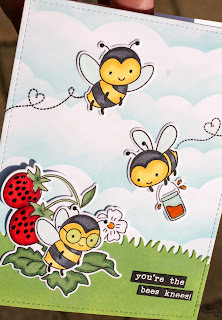 I used the coordinating Bee Happy dies to cut all of them out, then arranged them on the card until I was happy with the placement. Once I was satisfied, I used the "heart trails" stamps in the stamp set and the same Memento ink to stamp them onto the card base. I used Liquid Glue to adhere everything to my card panel, then attached the panel to a top-fold A2-sized card base. 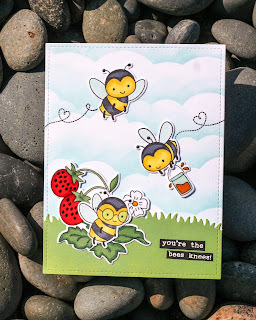 I took a scrap of Lawn Fawn Black Licorice card stock and VersaMark ink to stamp my sentiment, then sprinkled White Embossing Powder on top of the sticky ink and heat set it with my Heat Tool. The final steps were some subtle embellishments. 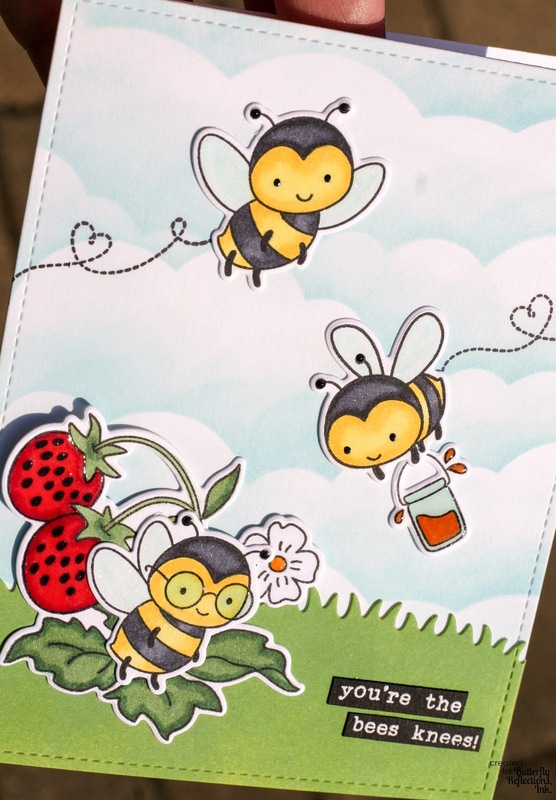 I used the Spectrum Noir Clear Overlay brush pen on the wings of the bees and then applied Glossy Accents to the strawberries, the glasses on the bumblebee, the "balls" on the antennae, the honey jar and splashes of honey, and the flower center. 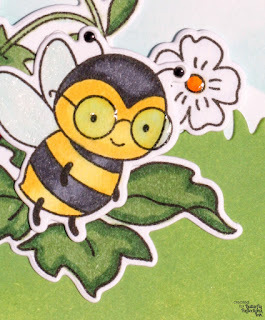 Finally, I used my black Glaze Pen on the eyes of the bees without glasses to give them a little bit of depth and shine.